Before the new one arrives, that is. When Alfa Romeo wanted to morph from the maker of compact hatchbacks and beautiful sedans to a semi-exotic builder of sports cars, it released one of the prettiest sports cars of all time, the 8C. Only 500 coupes and 500 spiders were produced from 2007 to 2010 but the 8C name is set to make a return as a 700 horsepower mid-engine supercar. 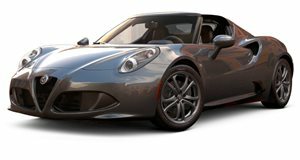 Before the new model goes on sale in 2022, Fiat Chrysler is offering the unique opportunity to purchase a brand-new 8C. FCA Heritage has a program called Automobiles' Reloaded by Creators, which restores old Fiat and Alfa Romeo models to their factory glory. The department is selling an 8C Coupe and an 8C Spider, built in 2007 and 2010 respectively. Both cars have reportedly "never left the factory," meaning they are essentially brand-new. FCA also says both cars have "only a few kilometers on the clock," and have "been suitably restored and certified by the FCA Heritage technical staff." When they were new, the coupe retailed for $265,000 and the spider sold for $299,000. Both cars have appreciated in value since then and these are likely the two best examples in existence, given that they are technically brand-new, only have delivery miles, and have been restored by Alfa Romeo itself. Under the hood of both cars sits a modified version of Maserati's Ferrari-built 4.7-liter V8 producing 450 hp mated to a six-speed automated manual. The transmission may not be smooth by today's standards but we'd gladly put up with it because of how pretty the 8C looks. Both cars will be sold at the Techno Classica in Germany from April 10-14 alongside other rare models like a 1955 Gran Premio Tipo 159 "Alfetta," 1977 Brabham BT45-Alfa Romeo, 1958 Fiat Nuova 500 with Abarth tuning, and 1982 Pininfarina Spidereuropa.